14/03/2019, 16:35 Consumer Day - New promotion and coupon at Q48 Superfoods! 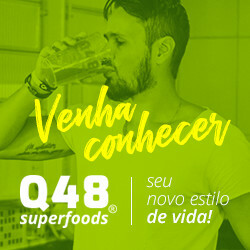 13/03/2019, 23:34 Consumer's Week - New banners in Q48 SuperFoods - Fit Products Store! 21/01/2019, 17:09 New banners in Q48 Superfoods - Healthy Products Store! 15/01/2019, 21:58 New coupon in Q48 Superfoods! New coupon in Q48 Superfoods! Coupon 5% on whole site! The Q48 SuperFoods is an online store of super nutritious foods that promote the health you need, regardless of your age, need, routine and / or physical activity. The company has a team specialized in nutrition that performs the necessary curation to elaborate our products and packs of super foods. Working with Clean Label products, that is, food formulated in the most natural way possible to meet people demanding and concerned about the safety of Your health. They are developed with ingredients that are free from dyes and artificial flavorings mainly, and can also be exempt from acidulants, flavor enhancers, preservatives and antioxidants, offering a list of simple and easy to understand ingredients. Providing practicality, nutritional density and health promotion is our purpose.